Wireworld Ultraviolet 5 USB review | What Hi-Fi? As Mrs Merton used to say, let's have a heated debate. The transference of digital information from point A to point B is proving mightily controversial on the whathifi.com forums. Take a look at a thread headlined 'cables' or something similar, and you'll soon see what we're talking about. There are those who state categorically that a sequence of zeros and ones, digitally transferred, cannot possibly be influenced by the connection it's passing down. And they periodically have right ding-dongs with those who, nevertheless, can hear differences between connections. We're not ashamed to admit that we're in the second camp, and this splendid Wireworld Ultraviolet USB illustrates why. 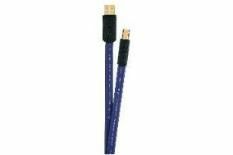 This is a two-metre USB cable – ideal for joining your laptop, say, to an external DAC, say, in an effort to get a workable sound out of a PC. Cambridge Audio thoughtfully provides a free USB connection with every DACmagic – and by comparison with a giveaway lead, the sound the Wireworld makes is leagues ahead. The gains in low-end body and punch, midrange spaciousness and detail, and high-end smoothness alone are significant. And, when you take into account the additional scale, superior timing and altogether more vivid presentation, the Ultraviolet 5/2 becomes a compulsory audition, if not an automatic purchase.